Home Ecology FIRST IN THE NATION CHLORPYRIFOS BAN! Hawaii did what Pruitt’s EPA wouldn’t. Today Hawaii did what the Environmental Protection Agency (EPA) under Scott Pruitt had failed to do: it banned the neurotoxin chlorpyrifos that can trace its genealogy to nerve agents used in World War 1. It took several years of grassroots activism, ongoing court battles, and a high profile advocacy campaign by a determined coalition, as well as leadership from key legislative champions like Senator Russell Ruderman, Rep. Richard Creagan, Rep.Dee Morikawa, Senator Mike Gabbard, and Representative Chris Lee. “In addition to banning chlorpyrifos, we fought hard for comprehensive reporting and no spray zones, and I am so pleased we got them,” said Lauryn Rego who serves on the advisory board of the Hawaii Center for Food Safety. “We have shown that toxic pesticides like chlorpyrifos can and should be phased out of our environment. And agrichemical companies that use Hawaii as their open laboratory now must report to the Department of Agriculture what is being sprayed, how much is being sprayed, and when and where those applications occur. This reporting will create a wealth of valuable data for decision-makers and researchers. What we have had so far has been woefully inadequate,” she said. Molokai mother, lawyer, activist, Keani Rawlins-Fernandez, whose child goes to an immersion school on Molokai that is across from Monsanto fields, welcomed the news. “At last! This is the beginning of the end of our worries about what our children are being exposed to,” she said. The ban will take effect in January 2019. Companies that need more time to respond to the chlorpyrifos ban may apply for extensions via temporary permits which will be available only until 12/31/2022. After this date there will be no exceptions and chlorpyrifos will be banned from all use in the state of Hawaii. In the lead up to this vote, the coalition had showcased the views of several scientists who have studied these pesticides, and doctors who have long advocated for a ban on chlorpyrifos. Doctors wrote and spoke of their first-hand encounters with various health conditions known to be linked to pesticide exposure in large studies. Several physicians last year co-signed an appeal to the governor urging a ban on chlorpyrifos based on their concerns. 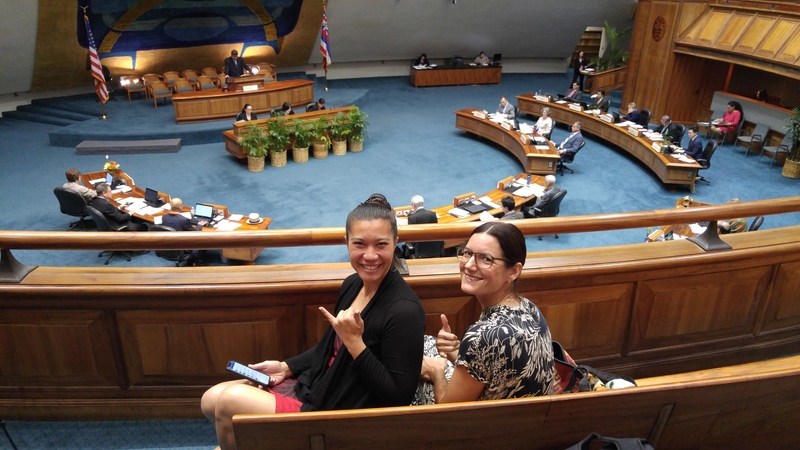 They cited the findings of the American Academy of Pediatrics (AAP) who noted that “the risk to infant and children’s health and development is unambiguous.” The Hawaii chapter of the Academy offered testimony in support of this measure. Robust reporting requirements and public disclosure will enable better research and improved protections for public health and the environment. The quantity and quality of the “individual entity reporting data” gathered annually has significant potential value for research, studies, and testing needs. The Public Report Summary itself will provide the average resident and visitor with data to make basic decisions such as where to live or where their children should attend school. “Today we moved a step closer to addressing the huge risk posed by the spraying of restricted use pesticides. This is real progress in safeguarding the health of the community,” said Hooser. “We thank the legislators for doing the right thing to protect public health and we count on their continuing vigilance in managing and reining in reckless corporate behavior,” he said. SB 3095 represents a turning point for Hawaii, and marks a new chapter for its residents and advocates in the Protect Our Keiki coalition who have repeatedly demanded protection against pesticide harms. The world’s largest agrichemical companies, such as Monsanto, Dow, and Syngenta, experiment and develop their genetically engineered crops in Hawaii. Because the majority of these crops are engineered to resist herbicides and pesticides, testing and development of these crops result in repeated spraying of dangerous chemicals. Many of their operations are adjacent to schools and residential areas, putting children and public health at risk. Voluntarily reported pesticide use data shows that these companies apply thousands of gallons and pounds of RUPs in Hawaii each year. Previous articleThe Tax Office Said So, So It Must Be True!